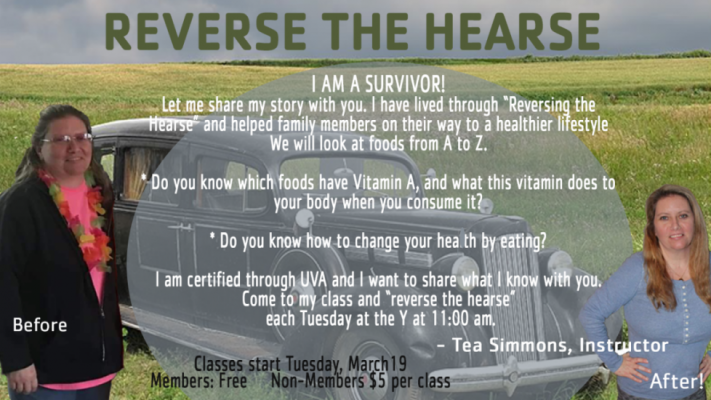 Each Tuesday, the Y offers “Reverse the Hearse” a program conducted by Tea Simmons, a Y member with the fabulous story of how she ‘reversed the hearse’ by making changes with her diet and exercise plan. The numbers of people who have been successfully removed from transplant lists as a result of lifestyle changes are very few. Come listen to Tea’s inspirational story and learn how you, too, can make positive changes to improve your health! Click on the link to learn more!